Recreation and sport management students at Indiana State University spent the spring semester learning lessons in leadership theory, diversity and outcome-based program/event planning. Then they put those skills to the test in a community engagement and service-learning project. Students in Assistant Professor Nathan Schaumleffel's fundamentals of group leadership class (RCSM-236) worked in teams to plan activities for children of residents, most of them international students, at University Apartments. While the activities were designed to achieve human development outcomes, participants and students managed to have a little fun in the process. 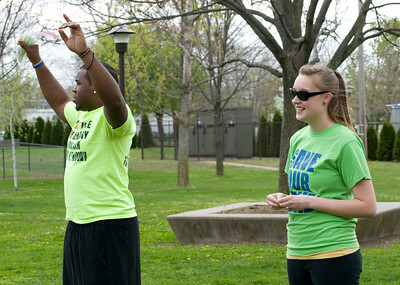 Leland Kinnett, a senior geography major from Mooresville, was on a team that created the "Goofy Olympics." "Today one of the three major childhood problems is obesity, so we wanted to do something athletic, but at the same time offer something fun and challenging," Kinnett said. A group of about 20 children gathered for the event. Participants split into teams and as their first task created a flag to represent their team. The rest of the afternoon's activities centered on physical fitness and included a javelin throw, water balloon toss and weight lifting. Group member Sidney Schuttrow, a senior recreation management and youth leadership major from Lowell, spent the summer working at her local parks department where she helped implement a similar program. She thought the fun twist on the Olympics would work well at ISU. "There are so many different activities you can do to make such a serious event like the Olympics seem fun," she said. "We wanted to emphasize how important physical activity is to kids of all ages. We wanted to show them how to have fun while learning new activities and being creative." Creativity was a common theme among all five groups, with activities including recyclable bowling, container gardening, making paper from recycled materials and a parachute drop. Each group of college students created a comprehensive, written activity plan. The plans addressed management issues and leadership styles, giving students experience in all aspects of program/event planning and leadership theory. "This three-year partnership between RCSM-236 and Residential Life is a perfect example of how academic and student affairs can unite to meet the mission of both units on campus and contribute to ISU's focus on community engagement and service-learning. The students meet the course learning outcomes in a more controlled setting and the residents are moved toward the University Apartment-Residential Life mission. We have had the unwavering support of Residential Life administrators and the on-site support of hall directors Andy Weyand and Johnwana Carson," Schaumleffel said. The course will continue to yield opportunities after the academic year is over. "The wonderful thing about this project is that it provides opportunities for students to continue their education by coming back to University Apartments after they complete RCSM-236 to take on a regular leadership role to plan programs for a full-semester for 300/400 independent study credit, practicum hours or fieldwork credit. RCSM-236 counts toward the American Humanics nonprofit organization management certificate, as well as toward the new recreation management and youth leadership minor," Schaumleffel said. The project has grown to include a graduate recreation management student position as community center coordinator, as well as a partnership-program model that was presented at the Indiana Student Affairs Association Conference in 2007. The project also is beginning to provide excellent opportunities for departmental assessment and the scholarship of engagement, Schaumleffel said. Bekah Carmichael, community center coordinator for University Apartments and a recreation and sport management graduate student, said the project is a positive collaboration, providing the students with real world experience while offering high-quality outcome-based programming for the housing community. "It helps out staff with programming during our busy time and gives the students experience in their major," Carmichael said. "The kids really look forward to it and it lets their parents, who are students, know their kids are safe during constructive activities." "The project wouldn't be successful without the support of Residential Life, the hard work of Bekah Carmichael, and the support and involvement of the University Apartments community assistants and residents," Schaumleffel said. Though Kinnett is not a recreation and sport management major, the project has helped him further his passion for working with youth. This summer he will work at Indy Parks and Recreation in Indianapolis and looks forward to using some of the skills he learned in RCSM-236. "I've always had a big passion for working with youth and this project has helped me learn more about everything that goes into planning events for them," he said. Recreation and sport management students spent the spring semester learning lessons in leadership theory, diversity and outcome-based program/event planning. Then they put those skills to the test in a community engagement and service-learning project.